Elegance will be spread on this Diwali if you send this Double Diwali Celebration Pack along with your wishes and prayers to your family. This Diwali special festivity pack has an entire box of tempting Badam Barfi (250 Gms) . Elegance will be spread on this Diwali if you send this Double Diwali Celebration Pack along with your wishes and prayers to your family. 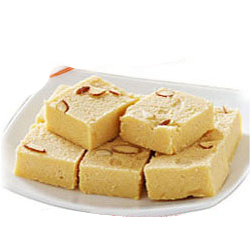 This Diwali special festivity pack has an entire box of tempting Badam Barfi (500 Gms) .